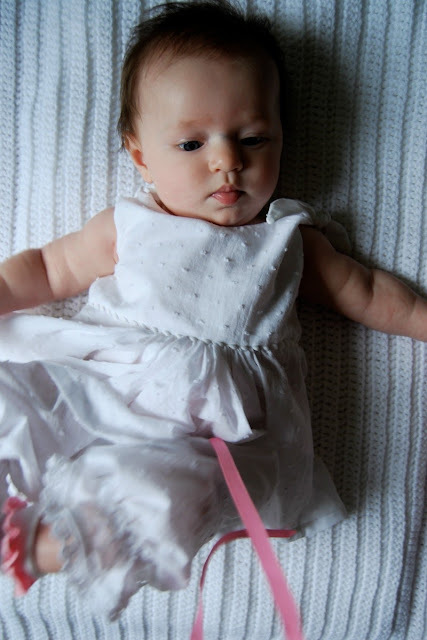 My mom gave me my old baptismal outfit for Jane to wear. And I planned on her wearing it all along until about a week and half before the service. Luckily I thought to try it on because it was too small. 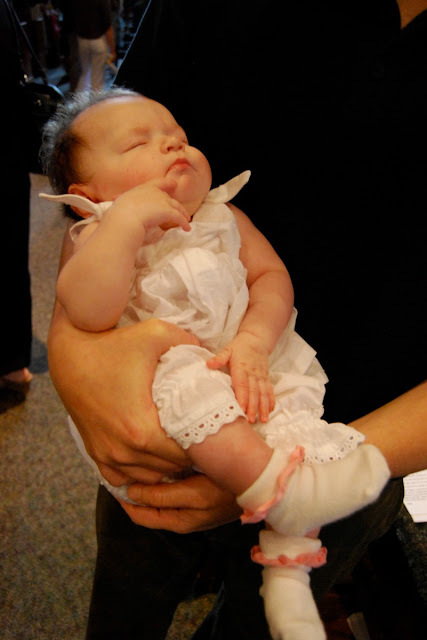 I think the original baptismal gown was made for a six week old baby. It would have fit her anyway except baby Jane's four month old chubby arms wouldn't fit in the sleeves. So I decided at the last minute to make her something quick and easy. 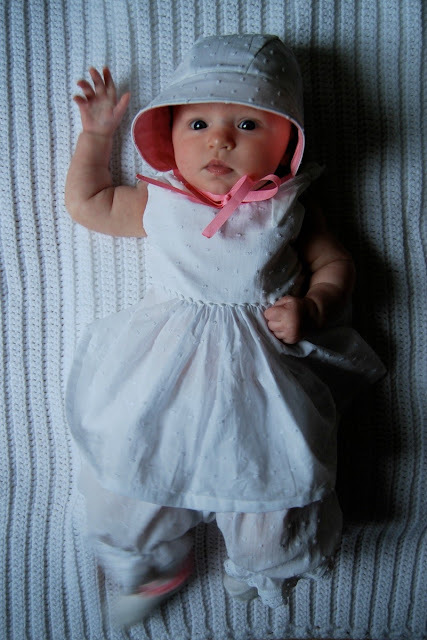 I think she looks like Little Bo Peep. I love that the outfit ended up looking fresh but old fashioned at the same time. I used swiss dot and a little bit of pink fabric I had in the stash. I love swiss dot so much. There is something so nice about those little puffs of texture every so often. I used my bodice pattern that I've used before. 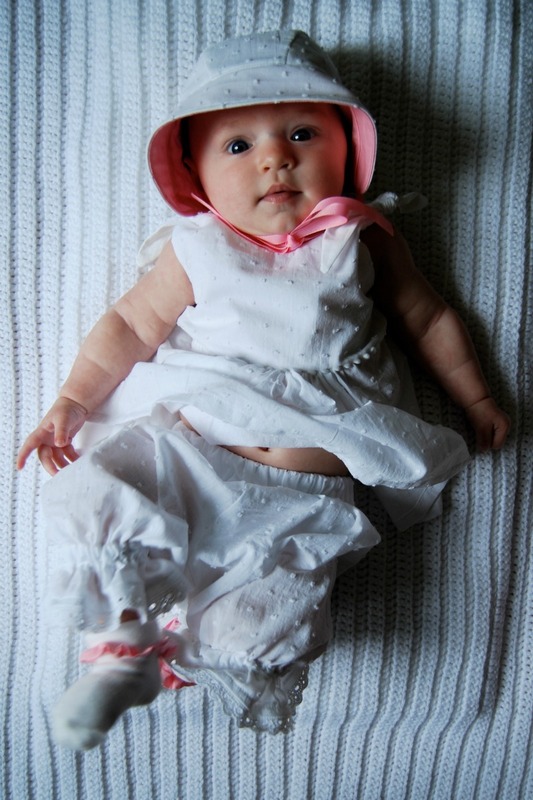 As a bonus I discovered that it fits her perfectly right now, so she can wear all those sweet little clothes I made her before she was born. The skirt of the dress is just a gathered rectangle. I cut it a little shorter so you can see the pantaloons underneath. The pantaloons! How crazy adorable are those little pantaloons?! When she just has the pantaloons on she looks like a little pirate. 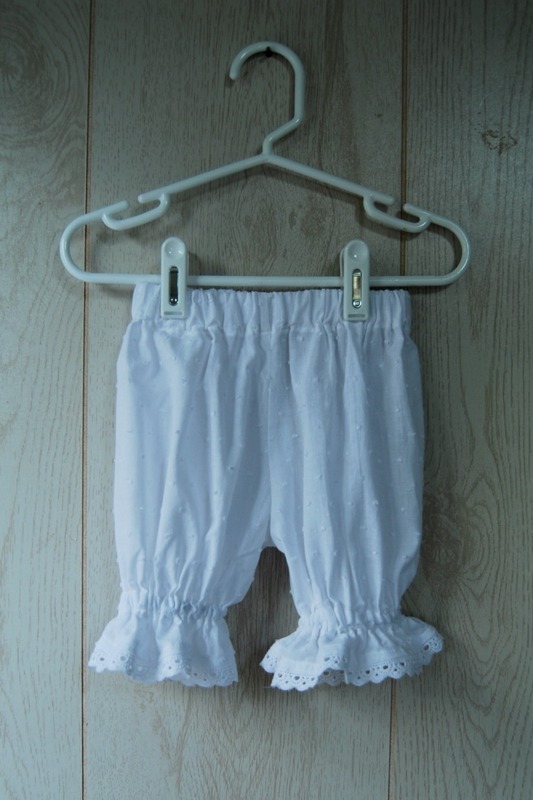 I added a little mini pom trim around the waist and some eyelet lace to the hem of the pantaloons. I really did keep it simple. 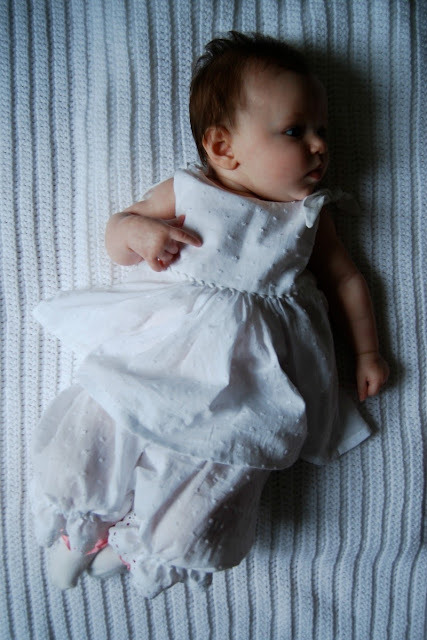 This was no heirloom baptismal gown. Just something nice and sweet to wear. Now the bonnet. Let me tell you about the bonnet. It's my favorite part. Little betty of little betty sews thoughtfully sent me her bonnet pattern when I was pregnant. I meant to make one up a while ago, but you know how things go with a new baby. I was excited to print the pattern out and sew one up for this outfit. And oh. my. goodness. 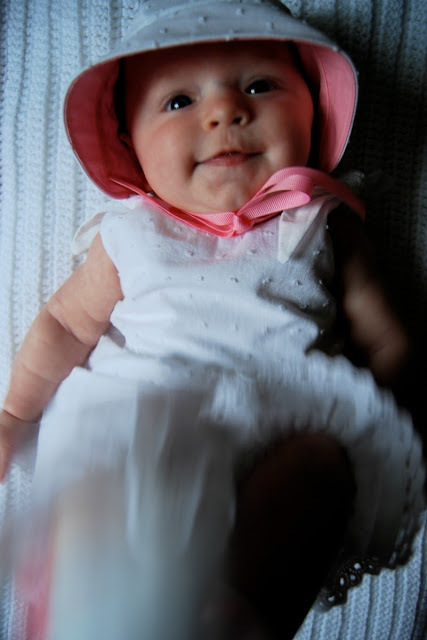 This little bonnet pattern is so darn cute that I almost can't stand it. The seams all match up perfectly which I am duly impressed with. I have made a fair amount of baby headgear now and very rarely have I had a pattern match up exactly right. Her instructions are in depth and perfect for even a total beginner. 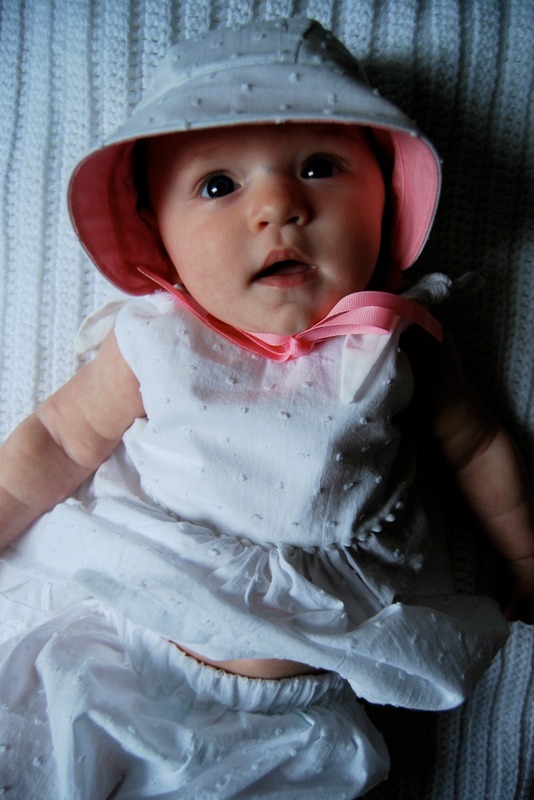 I highly recommend this little bonnet pattern. I will definitely be making more for my little bub. Can't you just see her halo now? ;) Despite this not being heirloom sewing, I will be packing this outfit away carefully. I'm so glad I was able to make it. I'm chalking this one up to another one of those times where I am so glad I can sew. Sweetness. That about sums it all up. Quick, quick post, my friends. Baby is sleeping. Fingers crossed that she stays asleep while I'm typing this. I was going to do some fancy editing and try and make my photos look seamless. But bah! Those were the things I did pre-baby. 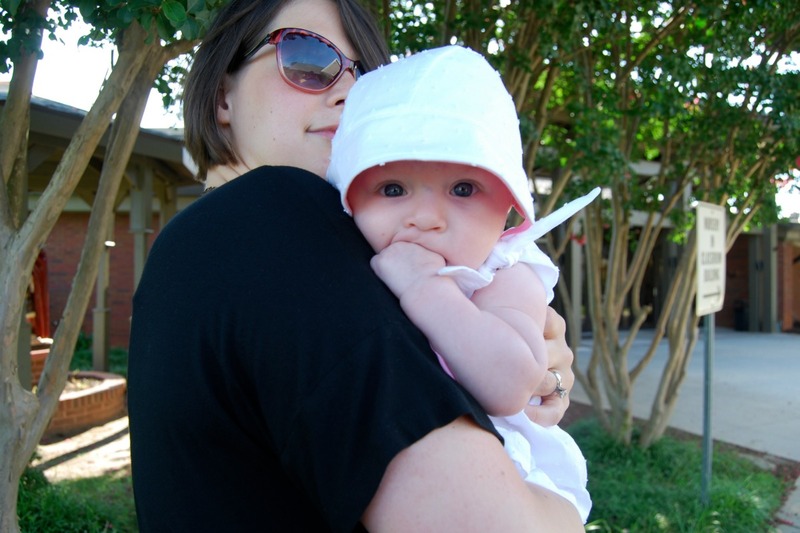 Post-baby is a whole new world. Every mom for herself. I have been sewing a bit. I've discovered the trick to sewing with a new baby is to do quick and simple projects. I actually was working on something rather complicated at the beginning of the summer and when it didn't turn out I for real cried thinking about all the precious sewing time I spent on it. Making something fast is satisfying and productive for those who only have a few minutes to sew. Like moi. Four so far. 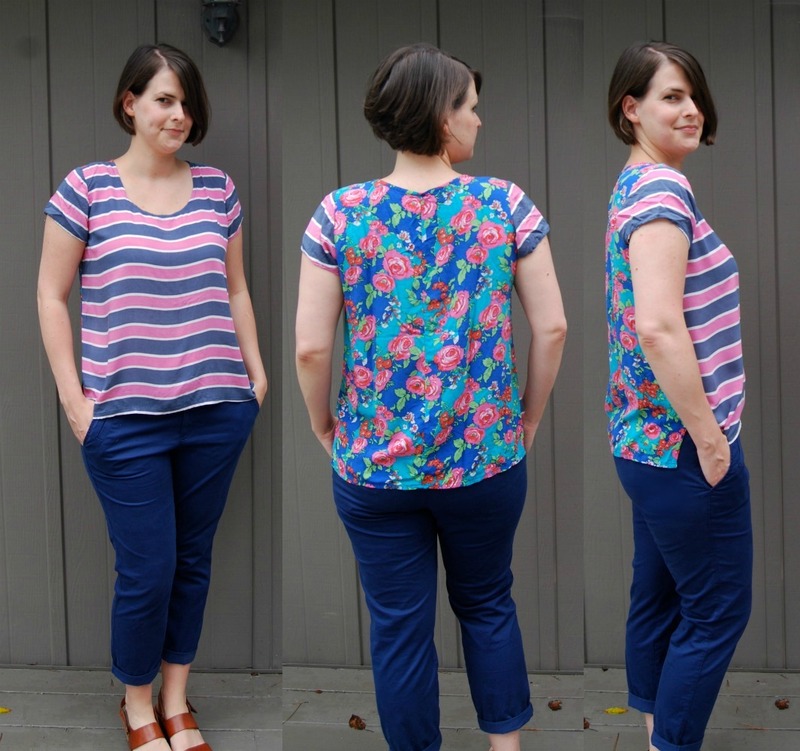 I was inspired by Sown Brooklyn's awesome, awesome sew along and Stephanie's fabulous swingy tees. I'm back at work as of today (sniff sniff) and I desperately needed a few tops for work. Nothing fancy. I needed some separates that would allow me to pump quickly while I'm at work and wouldn't make me feel self-conscious about my midsection. As much as I'd love to wear dresses right now, it's just not a possibility. For my first version I decided to stick to the original pattern and make it in a woven. I used a cotton lawn from the stash. I cut a size larger than I normally would due to my inflated bust but afterward I realized I didn't actually need the larger size. The neckline gapes ever so slightly and the shoulders sit just beyond my actual shoulders. I took in the sides almost 3/4" on both sides. I will wear this version but it's not my favorite. I'm not sure I'll make this in a stiffer woven again. Next I made a knit scout. This one is my favorite. I used some rayon jersey I had leftover from my wrap dress and hi-low'ed the hem. I just made that word up. I think this one is my favorite considering how much I've worn it already. My neck binding could be tighter. Then I made another woven version but in a slinky rayon challis. Check out the back. My attempt at mixing patterns. I'm quite pleased with it. Unfortunately both fabrics I used are super duper cheap and I don't see this tee holding up over time. C'est la vie. My last version was this spotty stripe jersey from the stash as well. I fixed my fit issues. I went down a size and took some width out of the front piece only. And I scootched the shoulder seam in so it sits on my actual shoulder. My neck binding is much better this time around. It's a winner.